No appointments, no waiting around - just great service! Get in touch for service or questions. We're here to help. LapinCare Repair Shield Now Available! Could it be? 2018-era Mac laptops appear to have a higher repairability factor than their predecessors. Thank you Jeff for saving the day! We had a laptop that was being used for one of our theatre productions that he was able to help save. Jeff is very knowledgeable, professional, and the turnaround for the repair was very quick. Thank you Jeff for all your help. I have a 2009 Macbook Pro that I’m giving to a friend in need. The battery no longer held a charge and the screen needed to be replaced. They offered me a couple options for the screen which would save me some $$$. Turned around the repair in one week! Very courteous, friendly, and well informed. What a great find! I was quoted $750 at the Apple Store after an accidental spill on my MacBook Air. Thank goodness for Yelp, I went straight to these guys and 3 days later my computer was repaired and ready for $450. Highly recommend! So good, and so much easier than getting to the genius bar. I was in and out in 15 minutes, with my old mac book pro working again. the technician checked a couple things to be sure my diagnosis (that i needed more RAM) was correct *before* he put in more RAM and charged me. The fee was quite reasonable, the service excellent. Went here to get my optical drive replaced as the one that came with my laptop was busted. My mac was still under warranty and Lapin fixed the problem and got it back to me within two days which is WAY faster than I would have gotten it back if I went to the Apple store. The gentleman who helped me out was extremely friendly and knew what he was doing. I would HIGHLY recommend this place to anyone who needs Mac work. They are true professionals. First Class … !!! These people keep their promises and stand 100% behind the work and went the extra mile. They understand that they are not fixing your toaster as we MUST have our computers. I would go far out of my way to deal with these people in the future. Thank you! Excellent service — prompt, efficient, friendly. I trust these guys. They know what they’re doing. This is the first time I have ever reviewed anything online, and im doing it because Lapin systems is a great place to take your computer. I do all of my work through my laptop and needed a quick turn around time. My computer screen was malfunctioning and completely black, i took it into Lapin. They ordered the part. They called me less than 24hrs saying my computer was ready for pick up with a brand new screen. They honor apple care as well. Honest and reliable service. A water bottle leaked and damaged my MacBook Pro. Bob was honest and reliable in his diagnosis of what was going on and helped me with deciding what I should do and what would save me the most money. As a real estate agent, it was so stressful for me as I rely on my personal computer for my work. Lapin, especially Bob, made this experience so smooth that I was able to get back to work with in a few days. My late 2011 17″ Macbook Pro suffered a failure of it’s graphics chip necessitating what could have been an incredibly expensive repair. Apple had issued an extended warranty period for this, but I knew nothing about it as I had bought mine secondhand. Every source of information I could find online said the warranty period had expired in February 2016, but in some rare cases Apple still covered the repair. A bit of a mystery to be sure and the folks at Lapin told me not to hold my breath, but it was possible Apple would take care of it. If Apple didn’t cover it I would have to throw the Macbook in the trash. Being the dumbass I am and not backing up my data, I was terrified. Two days later I got a text from Lapin saying the Macbook was fixed. Apple did indeed fix it under warranty. What a huge relief and what amazing prompt service from Lapin. Two day turn around, are yo kidding me! These folks at Lapin are exceedingly polite, professional and their technical expertise is as good as it gets. I cannot recommend them highly enough. Brought in my son’s MacBook Pro that had some malware problem. Even though they were swamped with other work, Lapin took 20 min on the spot to get my son’s laptop working again. We couldn’t leave the laptop there for the full clean (3 days) because my son was heading back to college, but Lapin was kind enough to help us in a pinch. Very grateful. Brian at Lapin is the best. After spending almost 6 hrs at my home he helped me reset and retrieve all my data after my iCloud acct was hacked. Hacking and phone porting is a real problem… call Brian to help you set up two factor verification and protect your devices! Their customer service and repair services are top notch! They’re also great about scheduling and estimates. Amanda is wonderful and treated me like a person rather than a number. You can just walk in. No need for “genius” appointments or long waits at the customer service counter. I highly recommend Lapin over the Apple Store. More than 3 years later and still the same impeccable service! Amanda was amazing, she went above and beyond the call of duty to repair my laptop aka my children’s favorite thing to destroy! Lapin Systems is not just about the bottom line, they care about their customers, I’ll never go anywhere else!!! I’ve turned to Lapin in Evanston to do minor repairs to an older Macbook Pro. Lapin does top quality work, quickly and at reasonable cost. The staff are professional, knowledgable and able to explain tech issues without jargon. And I’ve consistently found Lapin’s people welcoming and friendly. What a great experience I had with the folks at Lapin! They did a quick diagnosis of my late 2009 iMac and confirmed that the hard drive was failing. They replaced it quickly and got me back up and running in less than a week. I’m a bit high maintenance with my questions and they handled me in a very professional and friendly way. Pricing was more than fair. I’d recommend them to anyone with a sick Mac! What a great team. I’ve had them at my studio and have brought my computer to their office in Evanston. Both places I’ve received helpful and immediate solutions to my Mac problems. I can’t thank them enough for their expertise. I thought this kind of customer service was DEAD! Filled out an online service request, Bob met me at the door, saw my hard drive and said, “Your iMac won’t recognize your external, huh?” He ran it through a couple of software tests, applied a reformatting tool, and my 3TB of valuable photos were recovered in less than 20 minutes! He answered several questions too concerning my future plans for avoiding catastrophe. Online blogs said this process would cost hundreds and take days, IF they could help me at all! They are simply amazing! I brought there my macbook air which did not switch on. And of course I did forget to do a backup for something like 5 months. They managed switch it on, stored my data, sent it to apple (apple does assure you to save the data even if you are under warranty). They then got the computer back and migrate back my data. And everything in only few days and 75 dollars. I am amazed by them. They call you at every step of the way. Explain you with very simple words what happens. Suggest you the best way to act. Thank you! I will come back there for sure! Lapin Systems has been Chicagoland’s most trusted Mac resource since 1995. 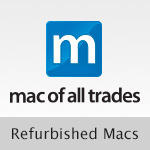 We fix Macs, and our passion is helping people and businesses get the most from their Macs. @patrickhughesjr We appreciate the feedback Patrick! Happy to help.